More than 15 years ago, Honda released the 2001 Insight, which still ranks as the most efficient gasoline-fueled vehicle ever made, at least according to the Environmental Protection Agency. The Insight’s 61 miles per gallon highway rating and combined city-highway rating of 53 mpg had many hoping fuel economy would improve exponentially. It didn’t quite work out like that, because although hybrid cars reduce emissions by 25-30% on average, most motorists are still driving traditional gas-powered cars. But Elon Musk, the influential futurist CEO behind Tesla and SpaceX, wants to change that. Tesla’s new car, the Model S P85D, not only set an all-time record on Consumer Reports‘ auto rating system, it broke the system altogether. The all-electric vehicle scored so highly, the publication was forced to rewrite its scoring system. And this summer, Tesla announced that the new Model S was so fast it required them to invent “Insane Mode,” a setting the company claims will let drivers go from zero to 60 in 2.8 seconds. Musk is an outspoken advocate for reducing greenhouse gas emissions, and he believes the Model S will change the way people think about electric and hybrid vehicles. Unfortunately, the Model S is out of most drivers’ price range, which is why the company will release a $35,000 version by 2017. And even though there aren’t many Teslas on the road yet, Musk’s vision is having ripple effects. The U.S. Energy Storage Monitor recently reported that energy storage deployment saw a “six-fold increase” over the first quarter of 2015. Energy experts say that electric batteries for cars, like hybrid car batteries, drove the recent surge in growth. In addition to demand for hybrid car batteries, the growth of renewable energy systems like wind farms and solar plants are increasing the need for better storage systems. And that’s another one of Musk’s pet projects. 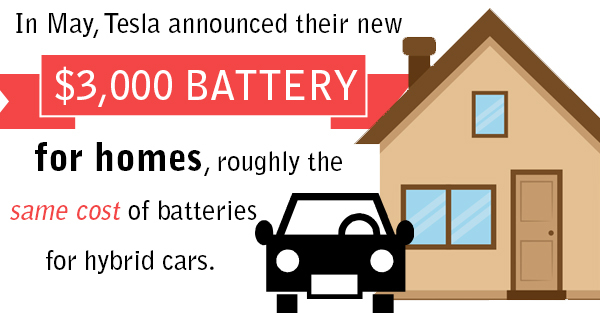 In May, Tesla announced their new $3,000 battery for homes, roughly the same cost of batteries for hybrid cars. Energy analyst Ravi Manghani says Musk is setting standards all over the place. “[The battery] has given a price target for other competitors to go after, at the same time it has definitely gotten the conversation more mainstream,” Manghani said. And increased competition ultimately means better hybrid batteries and electric vehicle batteries as well. Which means we’re one giant leap closer to a more sustainable future.